A Spring Awakening continues the story of David and Angela that began in A Christmas Calling (quite a lot happened in the first book; I'd highly recommend reading it prior to book 2). Easter is approaching and David and Angela have fallen into a fairly predictable routine of doing things together. But David has some niggling doubts about his new faith and about his future with Angela. And David's appointments with a therapist seem to muddy the waters, not clear them. David seems to be facing battles on almost every front: internally (grappling with the implications of his sister's early death), relationally (not sure how he feels about Angela), spiritually (continuing to face depression and doubt). And on top of all that, facing an accusation that threatens to crush his infant faith and possibly ruin his reputation. Living in what feels like a world (and mind) gone mad, David learns that not all battles involve flesh and blood and that when we face an enemy seeking to destroy us, the prayers and support of fellow believers can make all the difference. As David journeys through a very dark valley, readers witness both his outward struggles and his internal ones. I felt it was helpful to see that while secular counseling helped David in certain areas, other areas required spiritual intervention and support from a pastor. Cottee does a good job of showing the importance of each without disparaging either. 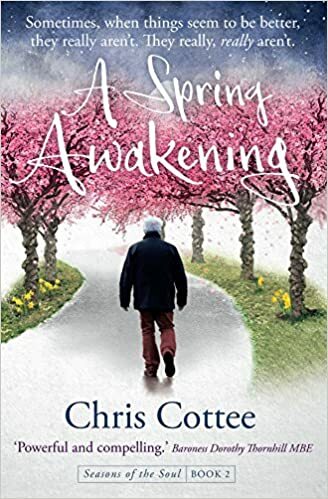 A Spring Awakening is a book of hope--offering readers a glimpse of a thawing soul and the emergence of a stronger, more authentic faith as a result. Disclaimer: I received a free digital copy of A Spring Awakening from Instant Apostle in exchange for an honest review. No other compensation was received.